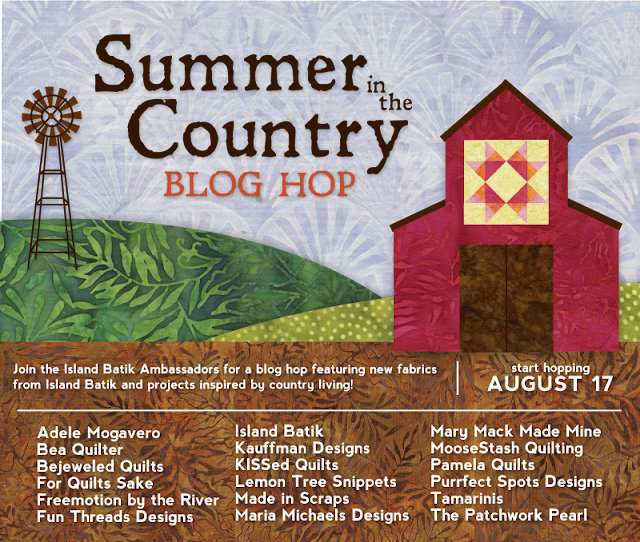 Welcome to the "Summer in the Country Blog Hop". One of my greatest joys, was becoming an ambassador for Island Batik. with a little inspiration long the way! is primarily from the Island Batik "Flower Fields" collection. and was thrilled, to be able to bring it to life, with these gorgeous batiks! It's a real "Summer in the Country", delight! Oh, now if only that teeny weeny bikini still fit! The snap, crackle and pop of fireworks! Every flavor in the rainbow. Sailing away, on a warm summer day! Even if only in my mind. Now, that's what summer in my country, is all about! Embellishments, I do love embellishments. They are so much fun to play with. They lend so much personality, and really bring things to life! Here's my "Island Batik" fabric lineup! I do believe, that this is the brightest "barn" quilt I've ever seen. Too, bad it won't weather well! They are fast and easy, and so portable for picnics. There is just no sense, in messing with perfection. Never have I been able to out-do these delicious bars! But I do have another fave, that I just have to share. But the best part is they are low fat and low calorie too! I know your probably asking just how, they could possibly taste all that great??? Well...they are made with canned pumpkin. It makes them so fudgy and delicious! Get the recipe right HERE, and see for yourself! Lastly, I've got a little give-a-way. Let me know what you would do, with these gorgeous fabrics. the last day of the hop. With a bar cookie or two in hand! Be sure to visit my fellow ambassadors. 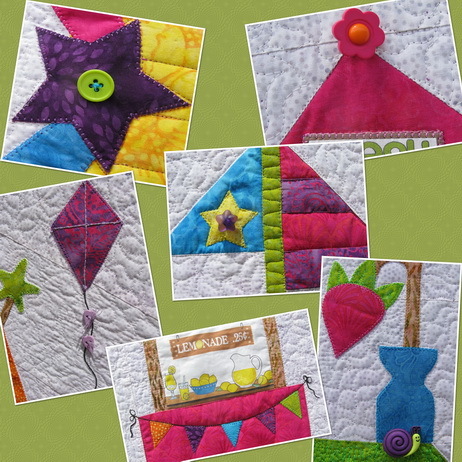 Your summer fun quilt is fabulous! The FQs are perfect for a tote! Wow! I love your quilt and all the little extras! I would make a table topper for my lanai. The bag is too cute! Thanks for the great recipe and giveaway. My son and his new wife have just become the 8th generation to live at our southern Ohio farm. I'm thinking of a sampler quilt, but incorporating brighter fabrics. I love batiks Flower Fields are GREAT! My granddaughter just bought a house & wants table runners - perfect! Love those bright happy colors. I would use them with some stash batiks I call sherbet colors to make a summery table topper. I would use the fabrics to make blocks for a friend who just last night at guild told me she would like her birthday and Christmas blocks in batiks. I have made a couple of those bags, yours if very cheery! Might have to make another if I win. Your quilt that you made is just beautiful! The use of the fabric is amazing! Thanks for sharing, I would make a little quilt for my Great Granddaughter. It would be perfect, and I love the little bag. Beautiful quilt Joan and I showed my dad and Builder Bob your post about the old car being transformed into a pond. They both thought it was pretty neat! I loved your quilt. So much fun. I would love to win. Maybe use the batiks for a tablerunner or a purse. Those bar cookies look delicious and so does the fabric. Don't know what I would make, but I'm sure to find something. .
HI - I love your new outdoor space, even made my husband look at your pictures. Bright fat quarters are always fun. I would use them in a paper-pieced project I'm starting. Love batiks - love the ones you are using. I use the same lemon bar recipe! Have you tried the enhanced recipe with cream cheese as the middle layer? It's excellent. I never have any left when I send them downstairs when DH and his friends run trains. I've learned to take out my piece before they go downstairs. Man, I'd make more of those Susie bags. They are da bomb. Love your creativity with the bright and happy batiks, very pretty. I would use the fats to make bright stars for a lap quilt. That quilt is really adorable, and the Island Batik fabric really makes it glow. I love your quilt,, it is so happy and cheerful! I like making small gifts for the granddaughters, I'd love to create a small quilt with those fabrics. Those bars sound so yummy! Your quilt is so fun, and I would use the FQ's in a summery, happy quilt. wow your quilt is gorgeous. I love all the bright and fun summery things going on.. 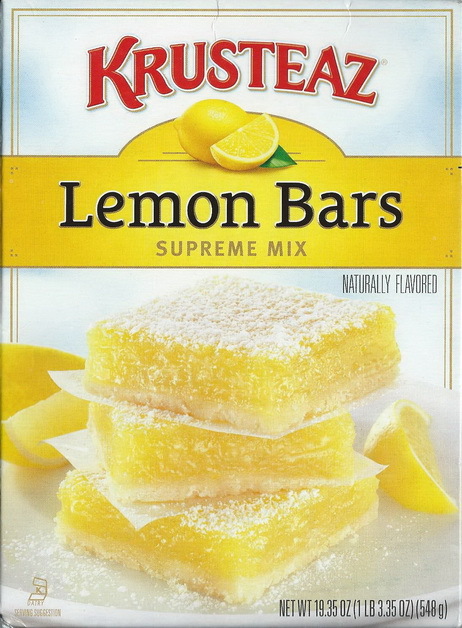 I remember my mom making these lemon bars for us five kids as a treat every once in a while. So I did the same for our kids. And now even they don't have kids of their own yet they are still doing it for them selves. Thanks for sharing. Amazing quilt. Thank you for sharing. I would make a tote with the lovely fabric. Thank you for the giveaway. Love, love, love your quilt! You are right- the Island Batik fabrics just make it sing! Lovely quilt. I would use them in a table runner. Fun post! The recipe sounds good. I love table runners, and purses. These would be fun in either. I loved reading your post! I would make a fall floral tabletopper if I win. Thank you for offering such a nice giveaway! I might make some sort of orange and yellow flower blocks with white centers and green stems. They're saying flower garden to me. ;) Love your summer sampler! I would make lots of hexies! I'd make placemats-such nice colors! gorgeous quilt! you are so talented! Love the batiks. I would like to make a bag with them. What a beautiful quilt, the detail is amazing. I think I would use these to make a quilted case for my sunglasses. The colours just shout summer to me. HELLO, what a neat post today! Love your projects! Love the little Bird!!! I'd love to make me a summer shopping tote with these! Thanks for sharing a pretty giveaway! I love those blocks, they're so fun and make such a cute quilt. I would make a cushion with those batiks. I do love Island Batik fabrics because they really do bring each block to life. This is the cutest Summer quilt and has everything about Summer that I love. You have done an amazing job creating such a lovely quilt. Thank you sew very much for hopping. I would use these Island Batik fabrics for Dress a Girl Around the World. Joan, your quilt is so awesome. I really love all the embellishments that you added. It just adds so much more cuteness to the quilt. Thank you for the giveaway. I would use these fabrics on my applique quilt that I am making. Wow, what an inspiring post, thanks for sharing all the eye candy! I think I would have to make a few more of those cute little Susie bags with those FQs - that is so cute!! I would use the fabric to add to my English Paper Piecing project. These make me think of citrus. First thing that popped into my head was half dresdens to look like fruit. Love your quilt, your blog and your yard decorations! As for the fabric.....I am a beginner quilter trying to make a quilt for my grand daughter and she loves bright colors. Thanks for the chance to win! I love your quilt! I would use the fabric in a quilt, it is so pretty! I totally adore your quilt. Wonderful! It screams summer. Your Quilt is sooooo Awesome!!! Such talented creativity you have!!! & I love your new Landscapeing project too! (see...there's more creativity!! lol) Love it all! Thanks for sharing Secret Bar's Recipe..& the Fudgey one too...definitely plan to try! Yummy quilt. Your embellishments are so much fun....and the car....well...it makes me smile really big every time I see it. What wonderful eye candy! I love your fun quilt and the Susie bag, and the car is delightful. And peanut butter fudge - swoon! 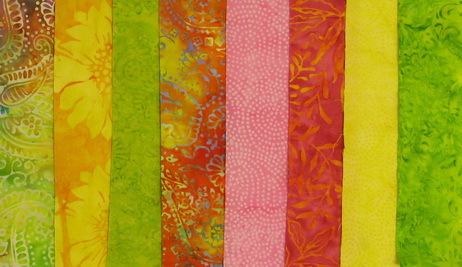 I would add some floral batiks to these yummy fat quarters and make a summery quilt. Thanks for sharing! Wow, your quilt is amazing! The giveaway bag is super cute and I love the fabrics. They look like a perfect start for a bright summer table runner. Thanks for sharing, I'm drooling over all the fabulous things in your post! Love your quilt - so happy! These fabrics would be perfect for new cushion covers for my patio furniture. Thanks! Your quilt is fantastic and so much fun to look at! I would make a table runner with these fabrics. Thanks for sharing. Just found your blog. Love it! Please enter me for the give away. My email is kayehlavaty@yahoo.com. Your quilt is just adorable! I also love to embellish! I have a GFG hexie quilt in progress using brights and setting with black-these batiks would be a great addition to this project! Great quilt, a lot of work but it was worth it!! I think I would add a few pieces from my stash and make a summery table runner. You have outdone yourself with that summer quilt, Joan. That is stunning. I love the beach gal behind the drape!! I would use those batiks to work on my NYBeauty blocks. Love your summer quilt. It is really cute, and perfect for the batiks. Love your pond, especially the waterfall. Love those citrus colors. Would love to make a bright rainbow quilt! I have been making these fun little zipper pouches/bags for pencils and school supplies for the kids and their friends. These would be great to make a few more in fun colors. These beautiful fat quarters would make a wonderful tote for a child or senior for charity. I have yet to see a batik fabric that I didn't like! I would use my winning batik bundle to make a colorful table runner for my hutch. Great little pattern, and even greater batiks! I'd love to win your wonderful giveaway. Thanks for the opportunity! I am doing a demo on small projects for our ASG group. I would use for some of the projects. I am currently working on an applique quilt and the batiks, and colors, would work perfectly. Thanks for a chance. Oh wow the fabric and the pattern.!!! What a cute bag! Count me in. 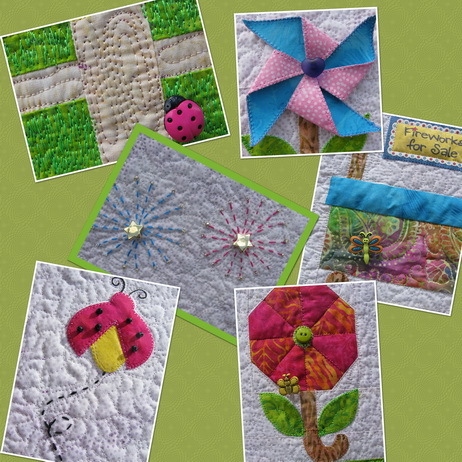 I love your Summer quilt, so cute and beautiful details! I would lve to win this adorable little bag, and these gorgeous batik fabrics! And I would probably make a quilt with them, or a table runner. Loving the quilt thanks for all the close ups Super hot still here in Az with no end in sight maybe an insulated wine bag thanks for the giveaway. PS. 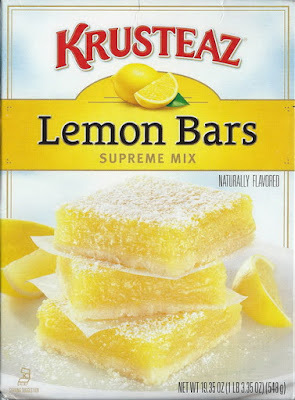 love lemon bars too. I love all the details in your Summer quilt. I would make a table topper with those pretty batiks. I would use these in my Alaskan qult. Oh your summer quilt is delightful. I am making needle holders for my friends for holiday gifts, with some embroidery on the front. These fabrics would be great for them. Thanks for sharing the giveaway. I would love to use those fabrics in a table runner or a wall hanging so I could look at them all the time. I love the quilt of sum mer activities made with the batiks. I plan on making some of those Susie bags so using those fat quarters for a bag would be great! Such a lovely quilt. I like the bag. If I won the giveaway, I would make an infinity scarf to go with the bag. What a cute bag! I love the bright colors and would probably make more bags. I would use the fabric in a scrappy quilt I'm working on! Such great colors. Your bag is really lovely. The batik colours to giveaway are quite citrussy and I would like to make a summer table topper for my kitchen. Wonderful quilt, I love your embellishments charms! Island batik colors are so shiny! I would like to make a summer table runner! I can see an appliquéd bug out of those fabrics. Maybe a Potato Chip bag. Love the bright ones and whites are always used since they make everything look so crisp. Thanks for the opportunity. Love your pond/waterfall. Oh, My. I love your quilt. You have caught summer perfectly in it. I'd love to make a few zippered pouches! I would use them in a Northern Wilderness quilt. I would add them to a Halloween quilt. That green looks perfect for a frog! That dessert looks delicious too. I would use them to make some cute Citrus Trivets I just saw on this blog hop!